Build a dream home with a Gladstone builder you can trust. We have a stunning selection of new properties to choose from. You’ll find different types of home designs which offer various styles and designs. We can even tailor our plans to suit your budget. Why not take advantage of the the Queensland First Home Owners’ Grant which is a state government initiative to help first home owners to get their new first home sooner. Contact our team for more information or to get things started. The continued service we provide after the initial handover is second to none, we don't just build and forget. Our commitment is not just about delivering you a beautiful home, it's also about addressing any defects you may encounter long after. 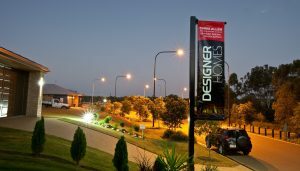 Chris Allen Designer Homes are a highly reputable and award winning builders with over 20 years experience throughout the Gladstone Region. Having built more than 250 homes, Chris and Dianne Allen have earn't a reputation around trust and reliability, the two most important areas of their business. When your talking about a persons dream and bringing this to life, Chris believes it's more than just being responsible for building another home. To the team at Chris Allen Designer homes, it's that personal milestone which they proudly share with each and every client, clients who they are proud to call friends for life. "Chris Allen and the team at Gladstone Designer Homes were a pleasure to deal with throughout the build process. Choosing fittings and colours for a new home can be very stressful, however with Gladstone Designer Homes partnership with local suppliers, that task was a breeze. Chris was always available to discuss any concerns with the build and didn't hesitate to attend to any minor issues after completion. Chris's reliance on local tradespeople gave me confidence that a high standard of workmanship would be maintained and any extra costs were discussed along the way, meaning there were no surprises at the end"
From our experience as first time clients with a builder we have been extremely fortunate to have had an opportunity of a lifetime, after securing a unique piece of land and designing a custom home to compliment the surroundings. 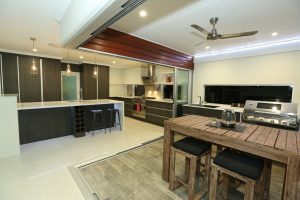 We were not satisfied with the quality and value for money that was being offered in Gladstone, that was the case until we met Chris Allen from Gladstone Designer Homes. Chris spent time introducing us to a few different development areas within the region that suited our needs. When a particular block captured our eye, we approached Chris to come up to block to see if the crazy idea could be achieved with the budget we had. The outcome of the visit and further research proved that yes, we could do it. Against all odds of never building before let alone on the side of a hill, yes we did it. We have been overwhelmed with how smooth our build has gone, this would never happened without Chris and his supporting team. Kelly the office manager warmly welcomed us, made everything well organised and kept the communication clear and concise. Chris also has an amazing team of sub-contractors who have shown quality workmanship. Thankyou Chris, Kell and team for making this happen. Building our first home was supposed to be a "challenging" "stressful" "bad" experience. But we think choosing the right builder can prevent all that. We wanted a Local Builder with a good reputation and Designer Homes more than exceeded all our expectations. The whole team worked with us every step of the way, until we were completely happy, and even beyond receiving the keys to our new home. You just can't beat that! Thank you guys for making our first building experience the opposite to what we were always told it would be! We look forward to building the next one with you! To date, Chris Allen and the team from Gladstone Designer homes have built 4 quality homes for our family over the past 14 years, including our sons first home. Chris Allen’s reputation of designing and building an excellent quality house, was the reason we chose to go with him back in 2002 with the build our new 5-bedroom home. The attention to detail, the top quality products and finishes that were a standard feature and the finished workmanship was why we have stayed with Chris Allen and his team for our builds since. Chris Allen and his team at Gladstone Designer homes are fantastic, no issue to big or too small and we have certainly given them challenges with steep blocks and builds with massive retaining walls. We could present an idea and then the team would come up with a plan to suit our needs, there was no plan not suitable, solvable or attainable. Chris Allen and his team can work through any issue, the contracts are straightforward and there were no hidden costs. We would recommend Chris Allen and Gladstone Designer Homes for your next build. Jason, Tamara and Joshua Burns. I had approached several local builders before I met with Chris Allen from Designer Homes and never having built before but having grown up and worked in the building industry myself I was immediately impressed. Not only did they surpass their competitors in price, they did so quality! From start to finish it was clear that I was dealing with a highly and friendly team who were committed to meeting my needs and took a lot of the stress away that normally comes with a build. I had a of friends who were also building homes with various local builders who could not believe the willingness Chris and the team from Gladstone Designer Homes showed to ensure every attention was payed, not to mention Chris Allen's standard range was a lot of other's gold range. There were no "Gotchas'' during or at the end of the build and everything on the building was on track and exceeding expectations. Chris was flexible and made available at any stage. I found him true to his reputation of being honest man and a high quality builder. An unexpected highlight for me in the process and a credit to Chris Allen is team of people he has accrued under the Gladstone Designer Homes umbrella. From the immediate employees to the electricians, plumbers, cabinet makers, flooring and fittings people and everyone in-between did an exceptional job. Working particularly with (Operations Manager/Site Supervisor/Delegate - LOL) Mitch and (whatever your job title is/Get me some Low GI Sugar:) Kelly who were excellent in informing me at every stage, guiding me how I could maximize the use of every dollar, anticipating and responding to my every need and want and worked hard to deliver our home. I wouldn't consider anyone else if I decided to build again! My home is stunning and I have no hesitation in recommending Gladstone Designer Homes to others. Gladstone Designer Homes built our house like it was their own home.